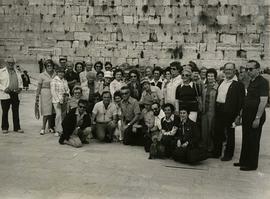 Photograph depicts a group of people posing in front of the Kotel (Western Wall) on the 1999 JNF Tour to Israel. 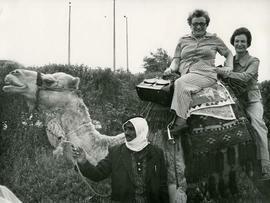 Photograph depicts Esther Dayson riding on a camel. Photograph depicts Cantor Murray Nixon and an unidentified woman standing on either side of a museum display case. Photograph depicts Sylvia & Bill Nemetz (in Israel?). Photograph depicts Esther Dayson with two men (possibly border guards) at outpost in Israel. Photograph depicts a project in Israel donated by Canadian Hadassah-WIZO.